Hello all, it's time for another interactive card! 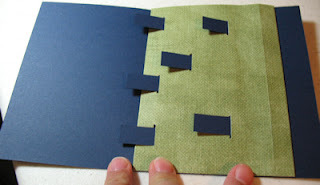 This card looks rather complicated but is very simple to make. I created another Halloween card. 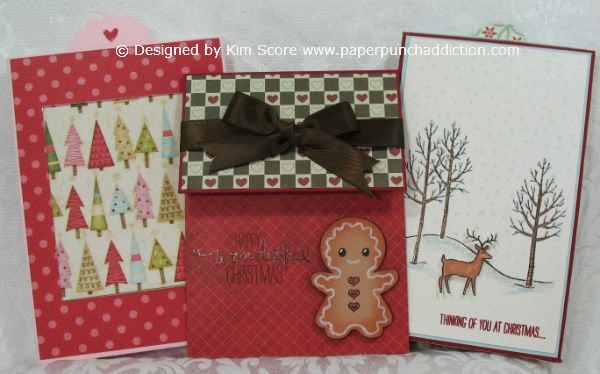 This one uses stamps by Rubbernecker and MFT and features a little punch art as well. The first shot is what the card looks like on the outside. 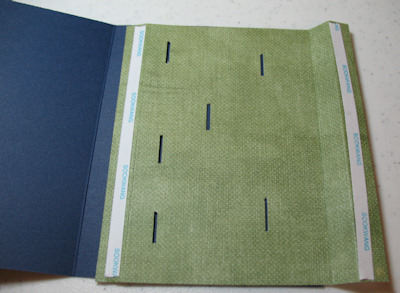 There is a belly band that wraps around the outside of the card to hold it closed. 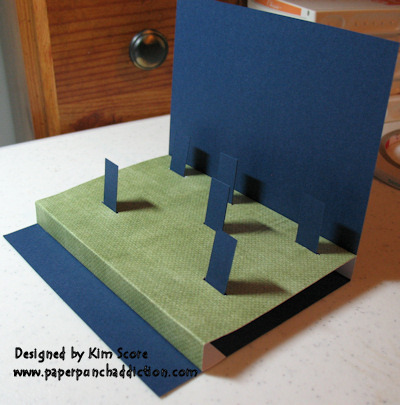 Please see the step by step instructions below to make a Pop Up Stage card. 1) The base is 5 1/2" x 8 1/2" (night of navy) folded in half. 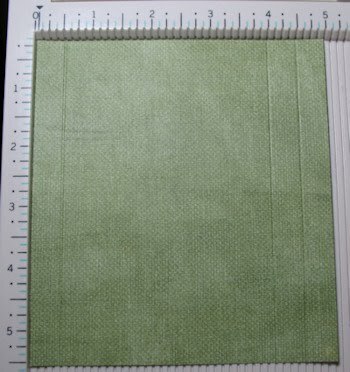 The pop up stage is 5 1/2" x 5" (green print). Score along the shorter side at 1/2", 4" and 4 1/2". 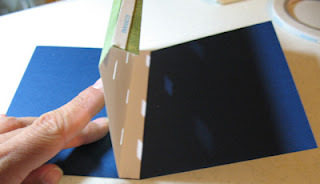 2) Use your fiskars cutter or a ruler and xacto knife to cut several slits into the top. Make slit a little longer than 1/2". Choose the number of figures or object you are going to put on the stage and cut those many slits. 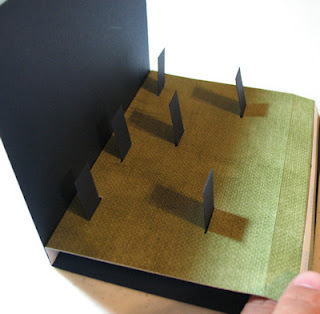 Keep in mind that the figures on the stage should not be taller than the measurement from the slit to the outer edge of the stage, otherwise, when you close the card, the figures will be peeking out from inside the card. 3) Add score tape (or glue, sticky strip, etc.) to the outer 1/2" sections as shown. Apply the tape along the score line. 4) Adhere the stage piece to the inside of the card base. 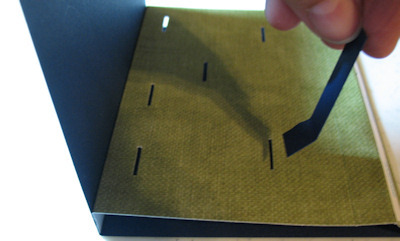 Line up the bottom of the stage piece along the center fold of the card base as shown. 5) Cut several pop up tabs 1/2" x 2". Cut as many tabs as you need for all of the slits on the stage. Score one end at 1/2" and add score tape at the score line. 6) Pull the backing off the score tape and carefully put the tab into a slot. Make sure that the little tab is facing the center of the card as shown. While holding the card open at a 90 degree angle, carefully adhere the tab to the card base so that it's parallel to the card back. 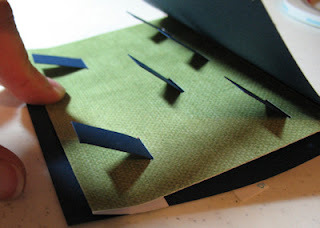 7) Once all of the tabs are in place, fold the stage edge under and adhere to the card base as shown. The card will fold nice and flat if you fold the stage end under, remove the backing on the sticky strip and then carefully close the card. Smooth and flatten card closed. The edge of the stage will ahere to the base of the card as shown. 8) This is what the card looks like when it's fully opened flat. 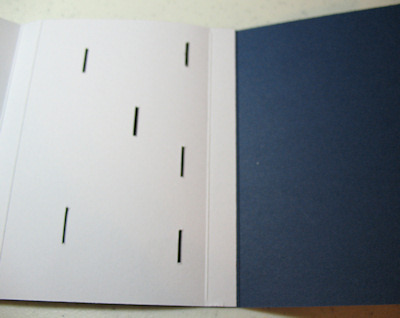 9)This is what the card looks like when opened at a 90 degree angle. Now you can decorate with your own images. Remember that the height of the figure can not exceed the length from the base of the tab to the outer edge of the stage, or it will stick out when the card is closed. I embellished my card with grass that I cut using an MFT die. The tombstones were created by punching a Stampin' Up! Wide Oval punch and cutting off the bottom. Snip away some little wedges to look like a crack. Use a zig pen to draw on some cracks and RIP. Sponge the edges with basic grey ink. The mummy and greeting is from Rubbernecker and the tree and owl is from My Favorite Things. 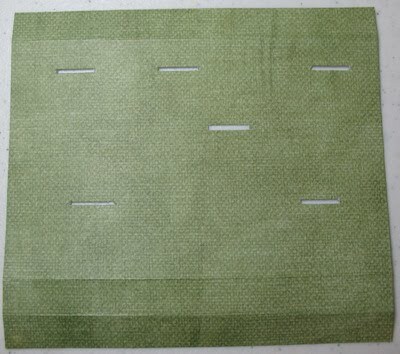 For the belly band, cut a strip that is 3" x 12" and another that is 1 1/2 x 12". Wrap the wider band around the closed card and tape ends together with score tape (but make sure not to get it stuck to the card base). Wrap the smaller band around the center of the wider band and tape. 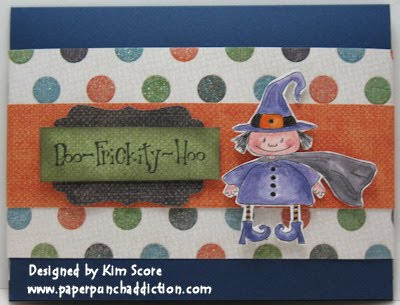 The witch is by Rubbernecker and was watercolored with stampin up ink pads and a blender pen. Are you a visual learner? Check out the instructional video HERE. Wow how cute is that! Thanks for sharing the tutorial Kim. Love it. My partner's daughter is right into Halloween, so might have to make one like it for her! This is gorgeous! Thanks for the tutorial-I never would have figured it out for myself! How adorable is that card?? Love it and too cute for words. 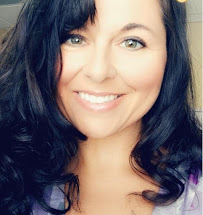 Tks for sharing your creativity, please keep up the great work! That is the cutest thing EVAH! Thanks so much for sharing your tutorial! This is the coolest thing ever!! You are amazing and thank you so much for sharing the instructions. OMGOODNESS, Kim!! This card is amazing! Such AWESOME instructions too! Thank you so much for taking the time to show us in steps how to!! This is so wonderful! I love it! You are so talented and creative! Thank you for sharing not only your own creations and tutorials but also taking the time to list other great blogs for us to visit! Oh my goodness how fun is that!! And you've used your MS board - I'll be making use of your measurements to make some fun pop up cards with my MS board too. TFS! LOOOVE it! so glad Toy pointed this out to us!! OH MY GOSH! 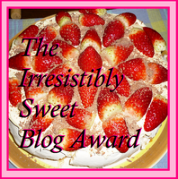 This is WILDY adorable! 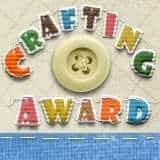 Thanks for sharing the tutorial over at Splitcoast Stampers. So cute! Thanks so much for the great tutorial! I tried this and managed to get mine to work! OMG I think you are very very talented to come up with this and love that it can be used for all sorts of seasons and holiday. Thank you for giving us the directions for this. Way more fun to add a surprise like this inside the card. thank you soo much for the tutorial!!!!! This is great! Thanks so much for the wonderful tutorial. I really appreciate that. thanks for this fantastic tutorial!